I’ll admit it; I’m a bit of a magazine junkie, and the marketers have caught on to my addiction. Like many people who are passionate about cooking, baking, and food in general, I started out subscribing to only a few: Bon Appetit and Martha Stewart. Coincidentally, then came the offers for a year of Gourmet and Saveur at an unheard of cost. I bit. Cooking Light, Food and Wine, and various others all followed, so that at any given time, I have a stack of magazines several inches deep on my night stand. I don’t look at these monthly publications as mere reading material, but as research and education (that’s my story, and I’m sticking to it.) My general routine involves going through the magazine from start to finish and dog-earing any stories or recipes that I find appealing. At the end of the month, I re-evaluate the recipes that I selected (I could have just been really hungry at the time,) to determine if they are something that I would truly prepare at some point. Then, I either tear them out or print them from the magazine’s web site, and I file them in my increasingly large archive. Some poor recipes have been sitting in those files for years, untouched, like those articles of clothing that you haven’t worn since college, but are convinced that you will need someday. It’s just hard to let go sometimes. If you cannot find the orange peppers, then just use two yellow peppers. I do not recommend substituting green peppers, as they tend to have a slightly bitter taste to them. This is a fairly thick gazpacho, so if you want to thin out the texture, add extra tomato juice and an additional splash of orange juice. The gazpacho will keep, chilled and tightly covered, for up to 4 days. The flavors start to blend and improve over time. The 1 teaspoon of crushed red pepper makes the gazpacho a bit spicy. Feel free to reduce or increase the amount based on personal taste. For an easy method of removing the corn kernels from the cob, invert a small bowl inside a large bowl. Stand the corn cob upright on the small bowl and cut the kernels off using a serrated knife. The kernels should fall directly into the large bowl as opposed to all over the counter. Light a grill or heat a grill pan over medium-high heat. Thread the garlic cloves onto a skewer. Brush the garlic, peppers, zucchini, onion, and corn with the olive oil and season with salt and pepper. Grill the vegetables, turning frequently, until lightly charred and crisp-tender, about 10 minutes. Transfer the peppers to a bowl, cover with plastic wrap, and let steam for about 10 minutes. Meanwhile, remove the garlic cloves from the skewers, peel them, and transfer them to a large bowl. Using a serrated knife, cut the charred corn kernels into the bowl. Peel the peppers and then add them to the bowl along with the zucchini, onion, cumin, crushed red pepper, tomato juice, orange juice, lemon juice, and vinegar. Using an immersion blender, regular blender, or a food processor, puree the vegetable mixture. 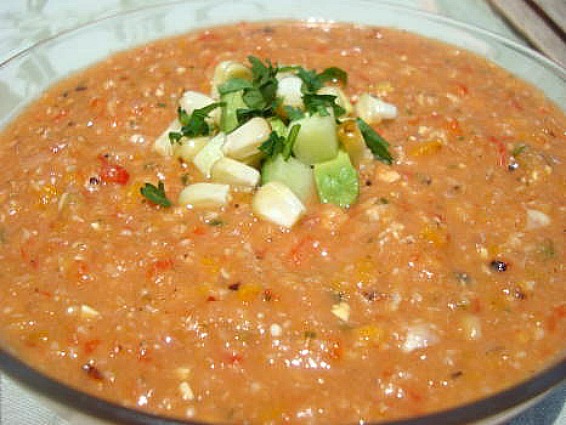 Pour the gazpacho into a large bowl and season with salt and pepper. Cover and refrigerate until chilled, about 2 hours. Just before serving, stir the cilantro into the gazpacho. Ladle into bowls and garnish with cucumber, avocado, onion, and corn kernels, if desired. I too have a problem with magazines. In particular, Cooking Light. I have every back issue since 2003!! Oh, goodness, I love this essay! I’m trying really hard to keep my number of subscriptions at two: Eating Well and Vegetarian Times. But I’m constantly tempted by issues of Bon Appetit at the bookstore, and I resist, knowing I have too many untried recipes at home already. A gazpacho made with grilled vegetables? This soup sounds dreamy and just perfect for summer. I’m going to try to convince my friends with grills that we should make your gazpacho. Thanks for sharing the recipe!